Frank Raczon, Senior Editor of Construction Equipment magazine, and HCEA National Director Keith Haddock present the newest look at the world�s leading heavy equipment manufacturer and its products. 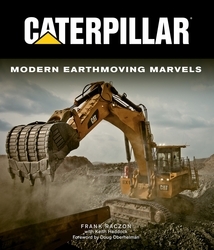 Raczon�s writing and Haddock�s research, technical expertise, photography and selection of subject material combine to produce a colorful and highly informational look at Cat machinery. Each chapter discusses one ore more types of equipment, and essays within each chapter typically focus early and modern examples culminating in the present day. The essays combine historical background and technical information, providing both the equipment enthusiast and casual reader unfamiliar with the equipment with an educational experience. Hardbound, 224 pages, 280 color and 45 B&W photos.